of bad faith when an insurance company refuses to pay a valid claim. Committed to vigorous and thorough representation of injury victims throughout Alabama while exercising the highest degree of professional, ethical and moral standards. An insurance policy is considered a contract between you, the insured, and your insurance company. As with all contracts, Alabama law provides that the parties to the contract must act in “good faith” in the performance of their duties towards one another. As the insured, your duty is to pay premiums on time and in the amount you have agreed to. The duty of the insurance company, on the other hand, is to timely investigate your claim in the event of a loss; to subject the results of the investigation to a “cognitive evaluation or review”; and to pay losses that are properly covered by the insurance contract in a timely manner. Alabama law recognizes two forms of bad faith when an insurance company refuses to pay a valid claim. The 1st form of bad faith is referred to as “normal” kind. This occurs where an insurance company intentionally refuses to pay a claim with actual knowledge that it does not have a reasonable, legitimate or arguable reason to deny the claim. The 2nd form of bad faith is referred to as the “abnormal” kind. This occurs where an insurance company intentionally or recklessly fails to investigate the claim; intentionally or recklessly fails to properly subject the claim to a “cognitive evaluation or review”; creates its own debatable reason for denying the claim; or relies on an ambiguous portion of the policy as a lawful basis to deny the claim. Insurance companies sell policies to their policyholders to help them through difficult times, to protect them against calamity. When a fire destroys your home, when disaster strikes your business; when your car, boat or other property is damaged or destroyed; when you are in need of long-term care; or when you have lost a loved one, you depend on your insurance company to be there. Many times, it isn't. Let’s face it, insurance company’s are in business to make money for their owners or shareholders. Insurance companies make money by collecting premium payments, not by paying claims. You need an experienced attorney in your corner when insurance companies fail to live up to the terms of their policies and unreasonably delay or deny payment of valid claims. Insurance matters can be complicated, or sometimes it seems insurance companies just want to make it that way. Insurance companies are often large national or global corporations with very deep pockets. Their goal is to pay you, at best, the least amount of money possible. In many instances, insurance companies have the resources to outlast you. But, this does not mean that they have the right to deny or delay your valid claim for benefits just so they can make your situation so desperate that they can take advantage of you by paying a fraction of the coverage you may be entitled to. If you have had a claim denied, or if you are experiencing other problems with your insurance coverage, it is important to have legal representation that will not be intimidated by the insurance company, its adjusters or attorneys. To win a bad faith claim, a bad faith insurance attorney must prove that the insurance company failed to honor its insurance contract and had no “debatable” reason not to pay. Many people whose insurance claims have been improperly denied believe that they can’t afford to fight for what is right because the other side will have deep pockets and can quickly outspend them. But, you don’t need a large bank account. Just an experienced attorney in your corner to fight for you. In most cases we can represent you on a “contingency” basis, which means you’ll only pay a legal fee if we make a recovery for you. If we don’t get results in your favor (through a cash settlement or a jury verdict) you don’t owe us a fee for our services. At John Ronald Spencer, P.C., there is never a charge to meet with you to determine whether you have legal rights that must be protected. The initial consultation is always free. You have nothing to lose if you make the call. But,you may lose all of your legal rights if you do nothing. Call (251) 445-0590 today to schedule an appointment with an experienced trial attorney. ©2014 All rights reserved. 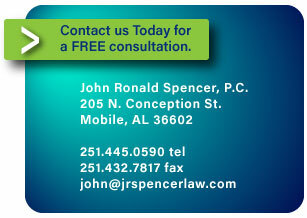 John Ronald Spencer, P.C. The content of this website is for informational purposes only and should not be construed as legal advice. Nothing contained herein shall establish or create an attorney-client relationship. No opinions regarding the value of a particular legal claim or future results are intended. Every case is different and must be evaluated upon its individual facts and circumstances. “No representation is made that the quality of legal services to be performed is greater than the quality of legal services performed by other lawyers.” Alabama Rules of Professional Conduct. Boating Accidents | Slips and Falls | Workplace Accidents | Wrongful Death | Insurance Claims | Unsafe Products | Fraud | Resources | FAQs | Contact John Ronald Spencer, P.C.